The Open Day is to support Sport & Play UK in lead up to the Cage Modernisation Program which is in aid of UK Athletics bringing all UK throws cages up to modern IAAF standard specifications (working in cooperation with The Hammer Circle (Association of British Hammer Throwers) and Home Country Athletics Federations. The reason for the Cage Modernisation Program was that earlier this year there was a near miss incident involving a hammer implement at a league fixture where it was very fortunate not to see a serious injury occur to spectators. As the safety of all athletes and athletics participants is paramount in sports. Immediately following the incident, UK Athletics conducted a thorough review of all UK cages. 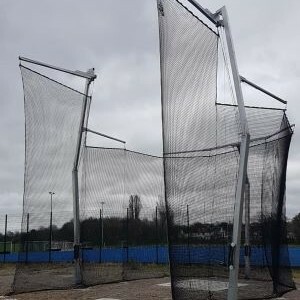 As a result of the review, UK Athletics has defined a new UK cage specification that will reduce the ‘danger zone’ of all UK cages and will provide increased safety for all facility users. 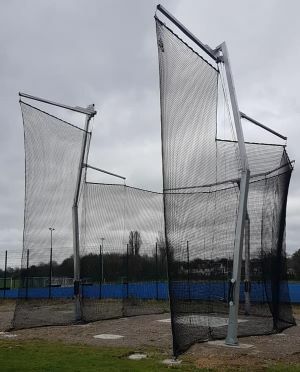 As it has it, the Athletics IAAF certified Thor 9 hammer discus cage designed and manufactured by PHS fits exactly that asset requirement.